No matter if you have just got your first sewing machine or you are a long time quilting pro we all use needles in our creating career. Yet some of us that use needles regularly are often baffled at the vast variety on the wall in front of us at the fabric stores. Realizing there are many more options than just hand or machine needles, many of us simply grab a familiar looking package, regardless of if it is the correct package of tools for the job. Depending upon method, and material, having the right needle or in some case needles, in our machines can truly be make or break to the project. So how do we start when choosing the right needle? Well, we first have to know what’s out there and available. You may even be inspired to create a new project just to utilize some of the amazing needles available on the market. Let us start with machine needles. Now as I mentioned if you have a modern domestic machine the needle system will be the same for all of these, if you are working on an industrial machine, well, that’s a whole separate animal. Check out my page on Industrial Machines here! First, a few things to note, unlike thread, the needles numbers is equal to the lower the number, the finer the needle. This is everyone’s go-to needle, why cause it’s called universal, it seems appropriate for everything, and for most of your projects you are probably correct. But here is how to tell for sure. Universal needles work well on most woven, synthetic, and natural materials. They have a slightly balled point allowing them to slip between the threads of the material without damage to the material. This creates a strong hold with a long-lasting quality to the overall project. Universal needles will range in weight. This makes the universal needle suitable for everything from lightweight materials, using a 60/8, all the way up to a heavyweight needle for dense fabrics such as a 120/20. This needle is ideal for interlock, cotton knits, rib knits, fleece, double knits, all knits really! The tip of this needle has a ball on the end, allowing the needle to gently move aside the knit materials when stitching. This means no snagging or puckering of material like other needles would. These also come in a range of weights for different weights of materials. From 70/10 all the way up to the 100/16, and, of course, multipacks, to be ready for any project. Now, you may be asking yourself what could the difference possibly be from a ballpoint to a stretch. Well, the stretch needle goes even further to prevent skipped stitches as well as preventing the snagging as will the ballpoint. The stretch needle has a specially designed scarf to this needle, preventing skipped stitches and making it great to sew elastic! It’s ideal for use with two way stretch knits, lycra, power net, silk jersey, spandex and any highly elasticized synthetic fabrics. With the stretch needle, you are able to utilize woolly nylon for extra stretch. With the weight of these needles, you mostly have two options light, 75/11 and heavy, 90/14. This is a needle designed for, you guessed it, JEANS! Also any densely woven canvas type fabric, a heavy twill or work wear. These needles have a very sharp point as well as a denser shank to help prevent needle bending/breaking. This also allows the needle to penetrate the fabric with ease. Due to the nature of this needle your range will be from a light-ish 80/12 all the way to a 110/16. For regular jeans I recommend the 100/14, especially for the top stitching. Now this doesn’t refer to the needle itself. Since all needles are metallic in nature. This cool needle is specifically for sewing with shiny threads like the embroidery rayons and metallics. Metallic needles have a larger eye than most, allowing for a delicate decorative thread to slide through without sheering or burring. This needles weight and point style is also similar to the universal needle, however with a larger eye. So, overall easier to thread, giving it great versatility. So when sewing genuine leather, we need to keep in mind it is not a woven material at all but a solid piece of solid material which will need to be cut with each needle punch, as we sew. The leather needle has a cutting point or a chisel point which cleanly cuts through the leather or very dense material. I will say, however, do not use with ultra suede, synthetic suede or PU imitation leather, as the desired result will not be achieved. Weight ranges from 80/14, up to 110/18. These are perfectly engineered needles for your machine embroidery in a few ways. They have the larger hole needed to accommodate the silky and rapid threads used for embroidery, rayon, polyester or cottons. But not only does it have the larger hole, it also has an exceptionally long scarf to prevent skipped stitches, which can occur from the material bouncing up and down during embroidery stitch outs. These weights are most common for light and heavy projects, 75/11, or 90/14, with very little in between. These needles are where we can start to get fancy! This needle has, what looks like, wings, two metal thin pieces, which act as a blade, cutting a hole into the material as you sew. When stitching with this needle you can achieve the ever-popular heirloom-decorative stitch. Not two identical needles, but two needles attached at the top with one shank. They are used for everything from practical sewing to decorative sewings such as pin-tucks, seam finishes and topstitching and more. This allows for very decorative stitching at half of the time. Load more than one color on two and utilize two colors of threads with parallel patterns and only one bobbin thread! Too Cool in my opinion and a must try, many machines will come with a twin or double needle in the original set up. Now This is where it can get tricky, all of the twin needles, come in most of the needle types. Some companies will color code for easy distinction. One brand of needles, Klasse, does the following- Blue-Universal • Grey-Ball Point • Pink-Embroidery • Navy-Jeans/Denim • Yellow-Metallic • Red-Stretch. Then you choose the weight for your project. These are very similar to the twin needles, however, you should sew at a slower pace and not for prolonged periods of time. Now, I have seen these everywhere and while the concept is way cool, they really don’t work well, at least in my experience. I do understand that for visionary challenges people or those with dexterity issues, it sounds like a lifesaver. What I find is that for every “self-threading” needle I use, one of two things happens, I have to rethread constantly or the small slit in the side allowing for the “self-threading”, catches my material, ending up ruining my project. 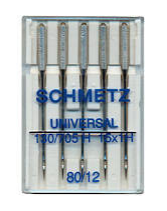 These needles are specifically designed for your overlock or serger machines. 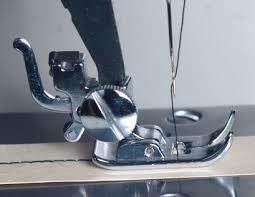 There are different needle systems available (about five of them) depending on the different type of serger you have. It is critical for the quality of the stitch as well as the life of the machine that you choose the right needle. Like all needles select the weight for the project and you are good to go. Love what you see? Want more from us? Sign up for updates and new free classes.